Great texture and beautiful rounded design. This is one of our best-selling headboards. 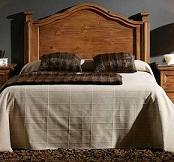 Warm and inviting smooth texture, solid pine, beautiful rounded design (feng-shui friendly)! This is one of our best-selling headboards.